Prison dramas, unless they are quality films, are often simply that - prison dramas. Genre films that are quickly produced, formulaic, and easily forgotten. 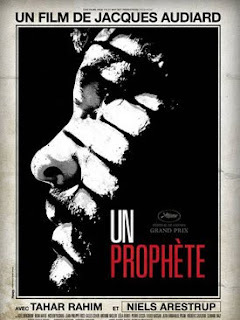 Not so with Jacques Audiard's Un Prophète, winner of the Cannes Grand Jury prize. For Un Prophète is, as they tend to say in France, un grand film. No big-name actors or flashy pyrotechnics, though the special effects for the apparition of a departed cell mate - ostensibly from Hell - with little tufts of flames singing his track suit, are rather nifty. No, the special effects are all in the acting - Tahar Rahim and Niels Arestrup (yes, French actors are no longer just 'Alain' or 'Jean-Paul') in the principal roles of Malik and César - and in Audiard's directing. Prisons in France are all the news these days. If it's not condemnation for overcrowding or suicide rates at ten times the non-prison population, it's spectacular breakouts with the help of hired or hijacked helicopters. Malik and César have no need for such high-profile techniques. César, as the grey-bearded godfather of the prison's Corsicans, can order an execution as easily as he can ensure privileged treatment for his troops. Malik, a quick-learning petty criminal whose primary talent is survival, comes to serve the Corsicans, even learning their language (the film is primarily in French, but with frequent, and credible, use of Arabic and Corsu). It's hard to say exactly at what point the Corsicans come to serve Malik, but that is clearly the trajectory. In prison films in the United States (I can see Brad Pitt trying to snap up the remake rights after his capture of the excellent French-Georgian thriller 13 Tzameti (2005)), the Corsicans would become the Crips, facing off the Bloods. In Audiard's film, the other major power brokers are 'les frères' - the brothers, referring to the bearded Muslim prisoners. They are not necessarily Islamists, but they are disciplined. Malik, himself of maghrebi origin but of no apparent religious conviction, somehow bonds with the brothers, but is also chummy with a gypsy (gitan) drug dealer who controls a deadly ring on the outside. Why have enemies when allies can come in handy, inside or out? The Outside. If there's anything in Un Prophète that shows how prison is just 'Criminality, Uninterrupted', it is the almost sheer impunity with which prisoners continue to ply their trade. There are cell phones, of course, and special prison delivery services with packages swung between barred windows. But Malik's specialty is making the utmost out of his occasional 24-hour paroles. César thinks that he owns Malik's hours on the outside. Malik has other ideas. I've already said more than I usually do about the content of a highly recommended film. Jacques Audiard, the latest in his family to gain cinematic glory, has made a keeper. 150 mins. In French, Arabic and Corsican.